Difference in overall survival between patients treated at the university medical center vs the city hospital. Difference in disease-free survival between patients treated at the university medical center vs the city hospital. Differences in overall survival by institution and race. Overall survival of patients treated at the university medical center based on tumor stage at time of presentation. Overall survival of patients treated at the city hospital based on tumor stage at time of presentation. No differences in overall survival occurred with the administration of adjuvant chemotherapy. Overall survival of patients with colorectal cancer treated at the university medical center. Overall survival of patients with colorectal cancer treated at the city hospital. Background Increasing evidence suggests significant disparity in colorectal cancer outcomes between black and white patients. Contributing factors may include advanced tumor stage at diagnosis, differences in treatment, more aggressive tumor biology, access to care, and patient comorbidity. Hypothesis Disparities in colorectal cancer outcomes exist despite similar objective measures of treatment. Design and Setting Ten-year retrospective review of all patients with colorectal cancer using tumor registries at a city hospital (n = 83) and a university medical center (n = 585) in the same city. We assessed stage at diagnosis; curative surgical resection; use of adjuvant treatment; overall, disease-free, and stage-specific survival; and socioeconomic status. Patients with nonwhite, nonblack ethnicity (4% overall) were excluded. Differences in stage and treatments were compared using the χ2 test, and median survival rates were compared using log-rank tests. Results Significantly more black patients were treated at the city hospital (53.0%) vs the university medical center (10.6%) (P<.001). No differences were identified in stage distribution or treatments received between hospitals or between black and white patients. Significantly worse survival was noted among patients treated at the city hospital (2.1 vs 5.3 years; P<.001) and among black patients treated at both institutions (city hospital: 1.4 vs 2.1 years, and university hospital: 3.2 vs 5.7 years; P<.001 for both). Disease-free survival rates showed similar significant reductions for black patients at both institutions. There was no association between survival and socioeconomic status at either institution. Conclusion The marked reductions in overall and disease-free survival for black patients with colorectal cancer do not seem to be related to variation in treatment but may be due to biologic factors or non–cancer-related health conditions. COLORECTAL carcinoma represents the second most common fatal malignancy in the United States and was responsible for approximately 55 000 deaths in 1997.1 Results of several studies2,3 have suggested a racial disparity in cancer survival, with survival in white patients exceeding that of black patients, even after adjusting for tumor stage at presentation. In addition, results of previous studies4,5 suggest that this racial disparity has been increasing since the mid-1970s, with improvements in colorectal cancer detection and overall survival improving among white patients but no comparable improvements among black patients. Several explanations have been proposed for this difference in survival, including a later stage at diagnosis, more aggressive tumor biology, increased patient comorbidity, and socioeconomic factors leading to less aggressive treatment in black patients compared with white patients.6,7 Although each of these factors has been recognized as potentially important, given the magnitude of the problem and the lack of progress in the past 3 decades, closing this disparity gap requires renewed focus on this issue and careful analysis of patient and physician variables. The present study was performed to determine the outcome of patients with colorectal cancer treated in the same city at 2 nearby medical facilities—a quaternary care medical center and a city hospital. We hypothesized that the data would show survival differences similar to those previously reported. Comparison of the treatment patterns between institutions, and the outcome of patients within institutions, may provide direction for future strategies to reduce the apparent disparities in survival. We conducted a 10-year retrospective review of all patients from a 700-bed quaternary care facility (Vanderbilt University Medical Center) and a 150-bed primary point of access city hospital (Metropolitan Nashville General Hospital). There was significant overlap of surgical and medical staffing between the 2 institutions. Patients identified in the tumor registry databases at each institution as having primary colorectal carcinoma between January 1, 1990, and December 31, 1999, were included. Patients with nonwhite, nonblack ethnicity (4% overall) were excluded from analysis. Tumor stage was assessed at the time of first clinical presentation. Resection was assumed to be curative if performed for patients in the absence of documented distant spread. Adjuvant treatments (chemotherapeutic agents or radiation treatments) were included if any treatment was received (completion of therapy was not required). Overall, disease-free, and stage-specific survival were measured and calculated from tumor registry records that followed patients to the last known date of contact. Socioeconomic status was estimated by matching the patient's ZIP code to the median income from that ZIP code using the Summary Tape File 3 of the 1990 Census of Population and Housing from the Bureau of Census. Patients were then divided into quartiles for analysis. For lifetime data analysis, survival was estimated using the Kaplan-Meier method,8 and differences between groups were compared using the log-rank test.9 For categorical data analysis, the χ2 test was applied to test the association between the institutions and the outcome variables. All tests of significance were 2-sided, and differences were considered statistically significant at P<.05. A statistical software program (SAS version 8.1; SAS Institute Inc, Cary, NC) was used for all analyses. During the 10-year interval, 585 and 83 patients with colon or rectal cancer were evaluated and treated at the university medical center and the city hospital, respectively. There were 62 black patients (10.6%) at the university medical center and 44 (53.0%) at the city hospital. At the university medical center, 312 male patients (53.3%) and 273 female patients (46.7%) were treated, and at the city hospital, 52 male patients (62.7%) and 31 female patients (37.3%) were treated. There was no significant difference in the ages of patients treated at the university medical center vs the city hospital (median, 69 vs 74 years) (P = .19). There was no significant difference in tumor stage at the time of presentation between institutions or between ethnic groups within each institution (Table 1). There was also no difference in the various treatment modalities identified (curative resection, chemotherapy, and radiation therapy) between institutions or ethnic groups (Table 2). There was a significant difference in overall survival between patients treated at the university medical center (median, 5.3 years) and those treated at the city hospital (median, 2.1 years) (P<.001) (Figure 1). There was a similar difference in disease-free survival (median, 4.1 years at the university medical center and 1.4 years at the city hospital) (P<.001) (Figure 2). Analysis of survival within each institution by ethnicity identified differences at each institution (Figure 3). Median survival at the university medical center was 5.7 years for white patients and 3.2 years for black patients (P<.001). White patients treated at the city hospital survived 2.1 years vs 1.4 years for black patients (P = .002). At each institution, cancer stage at time of presentation correlated with survival (Figure 4 and Figure 5). Examination of the entire population did not identify a survival advantage for patients receiving chemotherapy or radiation therapy (Figure 6). Subgroup analysis by race was not considered accurate because of the small sample size in each stage. There was a significant difference in overall survival of patients with colorectal cancer between institutions, with patients treated at the university medical center surviving a median of 7.8 years and those treated at the city hospital surviving a median of 1.5 years (P<.01) (Figure 7 and Figure 8). We identified no association between survival and socioeconomic status between institutions or ethnic groups (Table 3). During the study, 10% of patients treated at the university medical center and none at the city hospital were entered into clinical trials. 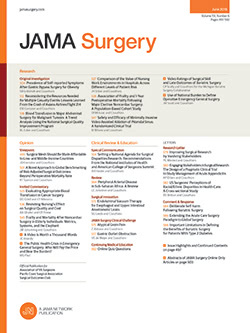 Previous studies have documented disparate outcomes based on racial backgrounds for many medical conditions, including heart disease, diabetes mellitus, and trauma.10 There is increasing evidence2-4 of a major disparity in cancer treatment outcomes for black patients with colorectal cancer compared with similarly affected white patient cohorts. This has occurred despite increased efforts at colorectal cancer screening and earlier cancer detection. Many possible contributing factors for this disparity have been suggested, including socioeconomic differences that limit access to care, more advanced stage at diagnosis, differences in tumor biology, and increased patient comorbidity. Possible explanations for survival differences have been difficult to assess because single-institution studies may not provide an adequate sample size, and analyses of administrative data sets frequently do not provide the specific clinical details needed about patient and provider characteristics. In the present study, we chose to compare patients within the same city cared for by overlapping physician groups to determine whether the observed differences in survival were the result of different patterns of treatment, physician performance, or patient response to therapy. Colorectal cancer, like most solid tumors, is a surgical disease. Survival is largely affected by tumor stage at presentation, but having a fit patient with a resectable tumor who has access to a competent surgeon is essential for the possibility of long-term cure. There were several striking findings in the present study. Patients treated at the university medical center survived more than twice as long as those treated at the city hospital (median survival, 5.3 vs 2.1 years) despite having tumors at similar stages. In addition, these survival differences were mirrored in the median survival between ethnic groups at each institution. We expected that these results might be explained by patients treated at the city hospital, or those who were black, having more advanced-stage tumors. Instead, we found no significant difference in tumor stage at presentation (Table 1). One possible explanation for the observed survival differences we hypothesized was the presence of comorbidity in the city hospital and in black patients, leading to an increase in non–cancer-related deaths. However, this seems unlikely because we also observed a marked reduction in disease-free survival among black patients and those treated at the city hospital compared with the university medical center and white counterparts (4.1 vs 1.4 years) (Figure 2). The contributing factor for the survival disparity may have been variations in treatment recommendations by physicians. This had been demonstrated in studies of other disease conditions.11,12 For example, there is evidence that race affects recommendations for cardiac revascularization. These issues have not been examined for surgical decisions regarding colorectal cancer treatment. In our study, we did not identify differences in the rates of curative resection, chemotherapy, or radiation treatment by race or institution. Furthermore, black patients treated at the university medical center had poorer survival than white counterparts despite identical surgeons with similar treatment patterns. Current tumor registry database review does not allow analysis of potentially important but subtle differences in treatment. Did the different patient groups have equivalent margins of resection, similar numbers of lymph nodes recovered, and adequacy of adjuvant chemotherapy or radiation treatments? It has been speculated that more aggressive tumor biology may be responsible for poorer long-term survival among black patients. Yet, the limited available data using current methods of tumor staging do not support this conclusion. In 1997, Chen et al13 reported results of a masked comparative study of 703 patients with newly diagnosed colon adenocarcinoma. In this study, black patients were less likely to have poorly differentiated tumors, high-grade nuclear atypia, mitotic activity, and tubule formation than white counterparts. Overall, black patients had better-differentiated cancers of the proximal and transverse colon (no difference found for rectal tumors), and no differences were found for vascular invasion, lymphatic invasion, tumor necrosis, fibrosis, and mucinous histologic features. Thus, this analysis of pathologic factors from the Black/White Cancer Survival Study3 did not support the contention that the usual assessed pathologic factors of tumor biology might explain poorer outcomes in survival. Of note, the coauthors of this study suggested that molecular markers of tumor-related activity might provide a better correlate of long-term outcome than conventional histologic variables; however, these were not assessed in the Black/White Cancer Survival Study, and we are unaware of any study resolving this issue. The role of access to care and potential bias of providers has been a difficult variable to assess in studies of colorectal cancer outcome.14 In a retrospective study of 3745 Veterans Affairs patients with newly diagnosed colorectal cancer in 1989, Dominitz et al1 demonstrated a similar rate of surgical resection (73% vs 70%), chemotherapy (23% vs 23%), and radiation therapy (16% vs 17%) use among white vs black patients. After adjustments for comorbid conditions, the 5-year survival rate for white vs black patients did not reach statistical significance (41% vs 37%; P = .11). One conclusion from this study was that in an "equal-access" system such as the Department of Veterans Affairs, the impact of race on survival of patients with colorectal cancer is limited. Although these data led the authors to conclude that access to care was the major determinant of long-term outcome, even these Veterans Affairs data suggest a trend toward a disparity in outcome based on race. Colorectal cancer develops as a result of the progressive accumulation of genetic and epigenetic alterations that lead to the transformation of normal colonic epithelium to colon adenocarcinoma. Predictably, advances in the molecular biology of colon cancer have outpaced our understanding of the clinical effect of the genetic alterations. Nonetheless, there is preliminary evidence15-21 that 2 of these alterations—allelic loss of a region on chromosome arm 18q (18q LOH) and microsatellite instability, a form of genomic instability—are associated with changes in the clinical outcomes of persons with colorectal cancer. It is possible that these molecular markers may explain differences in the outcome(s) demonstrated. In summary, we performed a preliminary 10-year review of colorectal cancer outcomes at a quaternary care university medical center and at a city hospital and demonstrated a marked disparity in overall and disease-free survival between black and white patients and between patients treated at each institution. This disparity is present despite patients having similar colorectal cancer stages at presentation. In addition, the number of patients receiving curative surgical resection, adjuvant chemotherapy, and adjuvant radiotherapy was similar in the 2 institutions during this 10-year interval. We believe that our retrospective data strongly support the need for a prospective study to clarify important variables that impact outcomes in patients with colorectal cancer and to provide solutions to the disparity in outcomes. This study was supported by a Discovery grant from Vanderbilt Ingram Cancer Center (Nashville, Tenn) and by grant U54CA91408-01 from the National Cancer Institute Comprehensive Cancer Center/Minority Institution Cancer Center Partnership (Bethesda, Md). This study was presented at the 109th Scientific Session of the Western Surgical Association, San Antonio, Tex, November 13, 2001. Corresponding author and reprints: Steven C. Stain, MD, Department of Surgery, Meharry Medical College, 1005 Dr D. B. Todd Jr Blvd, Nashville, TN 37208 (e-mail: sstain@mmc.edu). Stewart M. Hamilton, MD, Edmonton, Alberta: This 10-year retrospective analysis addresses the hypothesis that the outcome in colorectal cancer is poor in patients of African American heritage. The surgery was performed in 2 institutions, one high volume with about 59 resections a year and university-affiliated, the other low volume, a city hospital, doing about 8 resections a year. The ratio of African Americans was higher at the city hospital, but the number of African American patients treated each year at the high-volume university hospital was actually greater. The overall survival and the disease-free survival was found to be significantly better at the university hospital than for patients of white ethnicity vs African Americans. No association between socioeconomic status and survival was identified. Comorbidity was not measured. The authors cautiously conclude that the reduction in overall and disease-free survival did not appear to be related to treatment variables but may be due to biological factors or non–cancer-related health conditions and, as you know, they recommended further analysis. This is a retrospective study of medical records and so it at best provides Level 4 evidence. While the stage at presentation is said to be the same, my first question to the authors relates to the difference in tumor pathology. What was the distribution of tumors with respect to the segment of colon; was there neural or vascular invasion? What was the status of the lateral resection margins, and how many lymph nodes were retrieved from each specimen? While the premise of this paper is that there is a biological difference between African Americans and white patients in terms of colorectal cancer, to confirm such an assertion, the other variables should be controlled for. The paper confirms that outcomes are better in the high-volume institution, which in itself is significant enough to question the wisdom of persisting with colorectal cancer surgery in low-volume centers. There are also important surgeon-related factors that have been correlated with local recurrence and disease-free survival. Thus, my second question to the authors is, what differences among surgeons existed with respect to colorectal subspecialty training, number of resections per year, and the presence or absence of rectal perforation or tumor spillage during the surgery? Perhaps the most telling result of this study is the difference in survival between the two ethnic groups at the Vanderbilt University Medical Center. No information is given on the proportion of patients who were lost to follow-up or whether the patients completed their adjuvant therapy. Could issues of access or socioeconomic background, not necessarily related to income, be at play? In their discussion, the authors reference a Veterans Affairs study that in assessing an equal access health care system concluded, contrary to this study's results, that there was no difference in outcomes based on ethnic background. I suspect that genetic, environmental, and socioeconomic factors are at work, each of which contributes to overall health status. These issues are too complex to be unraveled in a retrospective study, and as the authors correctly conclude, a prospective in-depth study is required. Jack Pickleman, MD, Maywood, Ill: I would like to suggest to Dr Chapman that he might be barking up the wrong tree here. There is a wealth of data from the British literature which would indicate stage independent colon cancer survival dependent only on the surgeon performing the operation, and death rates as high as 3-fold have been reported in the British literature. It really depends who is doing the operation. I would suggest that to test this hypothesis you just switch faculties for 5 years, and you will see a leveling out of the differences you have noted. Francis J. Harford, MD, Maywood: I wonder if the cases were divided into colon cancer and rectal cancer. If the volume of cases were an important factor, one would expect to see it reflected more in the rectal cases than in the colon cases. Merril T. Dayton, MD, Salt Lake City, Utah: Maybe I missed this, but did you give us any information about risk factors in these 2 populations such as hypertension, stroke, heart attack, and so forth? Did that impact survival, and was your cancer follow-up careful enough to ascertain that these in fact were cancer-related deaths and not deaths from other causes? Ronald G. Latimer, MD, Santa Barbara, Calif: Other discussants raised the issue of the surgeon's skill in performing the operation. We were not told the level of the trainee doing the operation. Other confounding variables we know affect the survival such as nutrition and such simple things as the serum albumin. How did these affect the outcome in these patients? Another factor that affects outcome is the number of blood transfusions received, and one could suggest that the skill of the surgeon and the number of blood transfusions are related. Thomas Russell, MD, Chicago, Ill: There are other fields where this racial disparity has come out as far as outcomes following surgery. Certainly in vascular and cardiac disease I think this has been shown. Some issues have been brought up about high volume hospitals. Jack Pickleman has mentioned that the faculty should be interchanged. I think it is probably a little more complex than that with all due respect. I think the goal of this paper is very important as pointing out that there is racial disparity in the outcomes. As we strive for all Americans to get equal care, this brings up very important issues. Obviously, you have looked at the socioeconomic issues with a very gross way of looking at it, namely, the ZIP code, and I would hope that you could really get into some of these issues as smoking, blood transfusion, other comorbid factors, drug use, HIV status, the education of these patients in their involvement in their own care. The importance here is where are you going next with this paper. There are opportunities for additional studies, not only on the socioeconomic areas but the biological markers and the biological potential in the differences between the races of this tumor. Fabrizio Michelassi, MD, Chicago: Dr Chapman, let me just add a few more variables to your equation. In 1988, I presented a similar paper to the American Surgical Association. I was very young then and one of the discussants who took the podium was our current vice president, Dr Claude Organ. He gave me a major lecture on race, one that I still remember to date. In brief, he said, you may think that what is black is black and what is white is white, but the differences are not so well defined. He pointed out, rightly so, that there are different degrees of shades, and that if you go back several generations what you thought was white is not really totally white, and what you thought was black is not totally black. A few years later, I had the pleasure of presenting a follow-up study. In that study I had employed a new technique: quantification of ploidy. With ploidy, indeed, the importance of race was statically erased. Nowadays with microsatellite instability and other molecular and genetic variables, there might be explanations in different tumor biology that transcend race. Dr Stain: Dr Hamilton, you asked some very important questions. It was our impression that this was a complex issue, and clearly this study was not going to answer all of those questions. I think you hit the nail on the head. The most important or interesting finding was that the black patients at Vanderbilt were presumably getting quaternary care from highly trained subspecialists and had lower survival than their white counterparts. I hope there are not differences in provider behavior among the surgeons, but that issue deserves further study. Dr Hamilton's specific questions: We do not yet know what the distribution is of right vs left tumors. We hope to have that information by further analysis reviewing 666 charts in depth, with approximately 150 variables. We should have more data to present. The margins of resection will also be analyzed in that review. Vanderbilt does not have a subspecialist in colorectal surgery. There are surgical oncologists who participated in the care of these patients, but from the best we can tell, the care of these patients were shared between general surgeons and surgical oncologists. We do not have any data about lateral rectal spread or tumor seeding. You raised the issue of access to care, which I believe may be the key factor. I do not believe that patients of lower socioeconomic status have similar access to care. That is an area for improvement, and hopefully we can find a better way of studying it. Dr Pickleman, I will take your suggestions to Dr Beauchamp at Vanderbilt and ask if he would like to switch faculties for 5 years. However, the Vanderbilt differences of survival were the result of operations done by the same surgeons. One question came up about resident trainees. These were the same residents doing the operations, and I think we have to ask ourselves, is there something besides the surgeon causing these differences? Dr Russell had mentioned that data in the cardiac literature suggested that the race or ethnicity of the patient changed what was recommended by the provider. We would like to think it is not true that a physician treating a black patient would be less likely to recommend an operation or aggressive chemotherapy or radiation. Dr Harford, we do have specific data on comparing rectal cancers and there was also a survival difference. Dr Dayton, you correctly identified this is a retrospective tumor database, and I will go on record as saying I have trouble with believing a lot of administrative databases. I believe that a chart review minimally will be necessary and a prospective study ideally to get necessary information. Dr Latimer, we will get information on specific patient care characteristics such as albumin and blood transfusion. As a general surgeon I have some difficulty with the literature which suggests that colorectal surgeons or surgical oncologists do colon resections better. I agree it may be more likely for a low anterior resection or an APR, but for a right colon, I'm just not sure that it really makes a difference. Hopefully, some provider statistics will be available. Dr Russell, we appreciate your comments and I think where we are going next is that fortunately this project has been part of an NCI funded grant between institutions and we are collecting prospective data. Hopefully, we will come up with some information in a few years. Dr Michelassi, I actually received the same lecture from Dr Organ on race, and I was prepared to debate him on those definitions. Race is a politically incorrect term, in my mind, which I still use. It's been discredited by anthropologists as having no biologic and perhaps no genetic consequences other than skin melanin. The more inclusive term is ethnicity which is a social construct which includes psychologic, societal considerations. However, the reality of what we have in charts is the description by the provider who says "This is a white 32-year-old male" or "a black 45-year-old female." Anthropologists perform complex interviews where they ask the patient to self describe themselves from several different choices, and that is usually not available and I am not sure if we have the resources to provide that sort of in-depth prospective study.